Sure, Max Smart had a shoe phone, but I just picked up some new sandals that put that to shame. 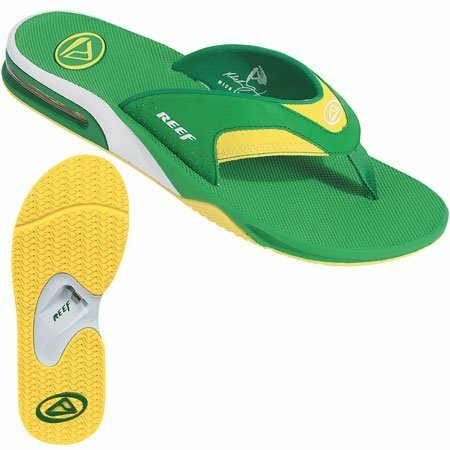 The Reef Fanning sandals, designed by pro surfer Mick Fanning, have a bottle opener in the sole!!! Yes, it's very frat boy, but come Cinco De Mayo - I will have an open beer. Also, to the best of my knowledge, this is the first time my choice of beverage has affected my footwear. [update] For the record, I bought a pair of blue Fanning's, not the hideous House of Pain color themed sandals pictured above. this is the first time my choice of beverage has affected my footwear. Are you forgetting about those moccasins that dispensed Torani syrup? Or your Kangaroos that stored a packet of hot chocolate mix? I wasn't counting the Franzia wine box galloshes either, cause the wine was gone, baby. Gone. I'm so glad we clarified the color choice, because I've seen those green ones in person, on the feet of the Sac State soccer team. I would hate for anyone to mistake you for a Mighty Mighty Hornet. Hey, I've got those too! I dig the sandals, even in green, so I hate to crash the party -- but doesn't this get dirt in the beer? And do you stand one legged while you do it? I think you'd get strange looks hopping around the ice chest at your next bbq, and I doubt you get any takers after the first offer to open your buddies' beers. This does not get dirt in the beer because you are opening a bottle cap. Nothing aside from a strip of metal touches the bottle cap. I have witnesses no dirt to ale transfer.